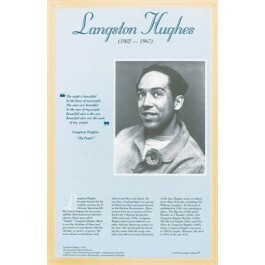 This unique educational poster of poet Langston Hughes features a striking photo of him, as well as a quote from "My People," and concise biographical text summarizing his life and career. 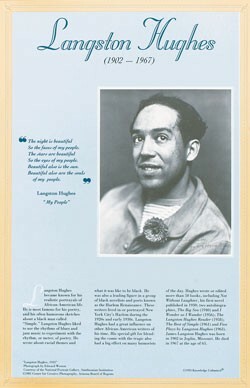 Langston Hughes was a leading figure in the creative movement that came to be called the Harlem Renaissance. He wrote about racial themes and what it was like to be black in America. He liked to use the rhythms of blues and jazz music to experiment with the rhythm of poetry. This poster is a great way to introduce students to one of the greatest and most influential poets of the 20th century.